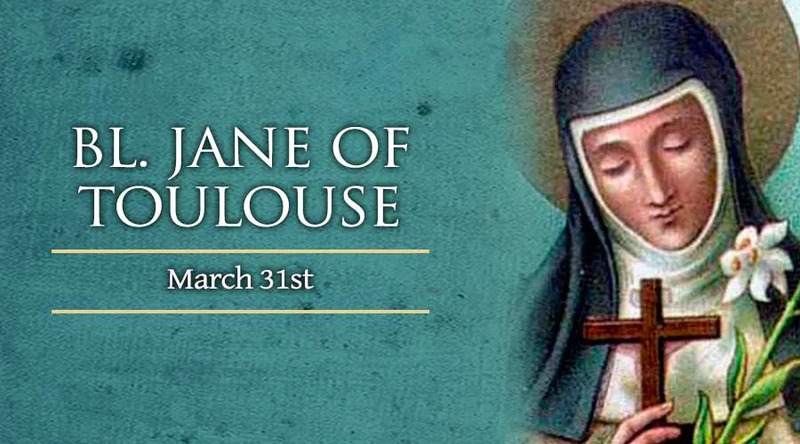 Blessed Jane lived in the French town of Toulouse during the 13th century. A Carmelite monastery was founded in the same town in 1240 which exposed Jane to the Carmelite lifestyle and spirituality. In 1265 when St. Simon Stock, a 13th century reformer of the Carmelites, was passing through Toulouse, Jane met him and requested to be affiliated with the Carmelites. Simon agreed and Jane became the first Third Order Carmelite. Jane vowed herself to perpetual chastity and applied herself completely to the Carmelite Rule. In addition to many daily holy practices and penances, she reached out to the community and worked to help the sick and poor. One of Jane's primary missions was encouraging the boys of the town to help her serve the poor and help them discern whether or not they were called to be Carmelites. Blessed Jane is considered to be a founder of the Carmelite tertiary order and is considered to be its first member.